Bobby Keppel’s bases-loaded fastball clearly grazed Brandon Inge. Joe Mauer’s slicing drive down the left field line landed fair by at least two feet. And Chase Utley needed not one, but two blown calls to reach base safely in the ninth. Or at least these misfortunes were clear enough on instant replay. But the umps ruled otherwise and another World Series dream was deferred for the Tigers, Twins, and Rockies—all small-market clubs, conspiracy theorists will be pleased to note. We’re only through the division series, but Major League Baseball’s umpires have made enough blatantly bad calls that commentators have already begun their yearly rite of harping on umpire mistakes and raising the specter of broadening the use of instant replay in baseball. Equally true to form, Commissioner Bud Selig has already reiterated his staunch opposition to anything of the sort. Arguing against the innovation, Selig (and many others) cite the negative impact it would have on both the length of the games (already really long) and the integrity of the sport (its humanity at risk of being overrun by techno-wizardry). Both points are bogus. The argument that the instant replay will elongate an already painfully lengthy sporting event hardly deserves a rebuttal. Reviewing a crucial, late-inning play would take about as much time as, say, it takes David Ortiz to spit on his hands between each pitch. And if anything is integral to the sport, it is its complete and utter disregard for haste. Fans are more likely to cotton to the argument that instant replay would wreck the purity of the sport. That’s because baseball, as our national pastime, is constantly (and conveniently) being re-imagined as a rare bastion of innocence in the otherwise bleak moral landscape of sports. “Human error is part of our sport,” Selig noted in quasi-biblical fashion in 2005, following yet another postseason marred by controversy. Oh c’mon. 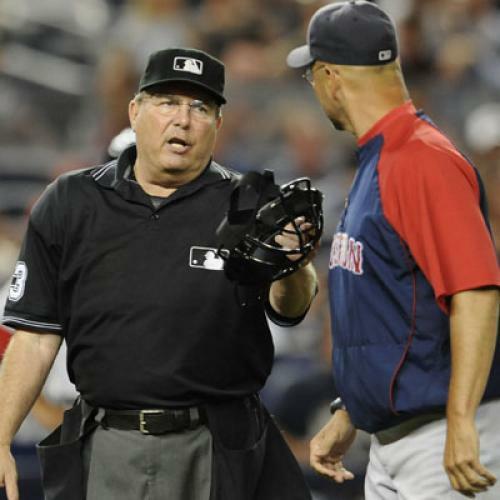 The game is already so filled with technology that denying it to umpires simply hangs them out to dry. Forget the obvious scandals over corked bats and human growth hormone—today’s players review endless hours of playback to prepare for opponents, sometimes even going into the clubhouse during games to review their last at bat. Many wear special, tinted contact lenses to see the ball better in different lighting conditions. And then there’s the fans, who don’t simply watch the game on television—instead, the networks employ state of the art pitch-tracking systems that indicate how many inches a curveball breaks, its velocity when it leaves the pitcher’s hand compared to when it crosses the plate, and of course where it lands in the strike zone. Fox will even on occasion paint an obnoxious fiery path that mirrors the arc the pitch traveled on its way to home plate. All of which begs the question: If instant replays in slow motion and high definition are available for the entire world to see, how long will it take for fans to become alienated when their team loses on a bum call? The greater threat to baseball’s purity, it seems, is for a million people to see one thing and have the poor ump rule the other way because he couldn’t check a playback. So bring on the instant replay, but set up a system in which managers must be judicious about when they can challenge plays. The only major loss I can think of will be that fewer grown men will protest calls by kicking dirt or throwing a base on television.